Curtain Call Theatre (CCT) was dragged into a worldwide legal dispute between Hollywood and Broadway Producer Scott Rudin’s production company Rudinplay, the Estate of Harper Lee, and Dramatic Publishing Company. We were threatened with a lawsuit by the law firm representing “Atticus Limited Liability Company” (a licensee of Rudinplay). 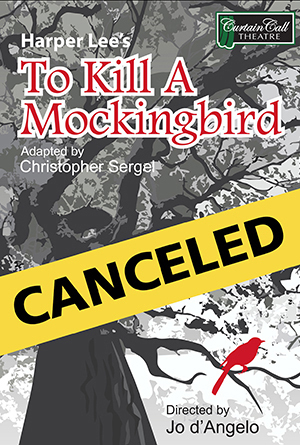 Due to the substantial financial impact defending such an action would have on our small theatre group, we had no choice but to comply and, thus, cancel our upcoming production of To Kill a Mockingbird. Not doing so would put our theatre at great risk. We want to assure the public that CCT is in no way at fault. Please know that our box office will be reaching out to all those who have already purchased tickets for To Kill a Mockingbird to issue refunds. Braintree, MA. All Rights Reserved.